These two construction workers always noticed that their boss always left early on Fridays. So one asked the other that if the boss left early next Friday if he would want to also. Sure enough, when Friday came, the boss left early. Therefore, the two men left also. The one offered the other to join him down at the bar, but he decided to just head on home. When he arrived home, he heard a noise from up stairs. When he reached the top of the stairs, he noticed that the noise was coming from the bedroom. 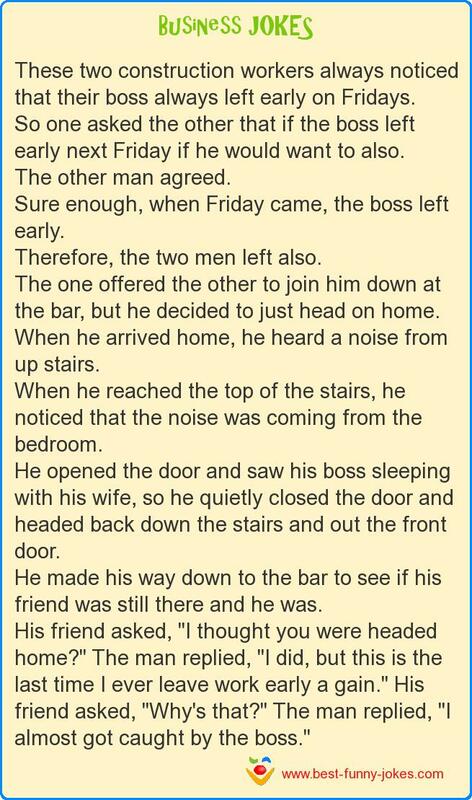 He opened the door and saw his boss sleeping with his wife, so he quietly closed the door and headed back down the stairs and out the front door. He made his way down to the bar to see if his friend was still there and he was. His friend asked, "I thought you were headed home?" The man replied, "I did, but this is the last time I ever leave work early a gain." His friend asked, "Why's that?" The man replied, "I almost got caught by the boss."